The development of the Great Seal of Kansas and the Seal of Kansas came after much discussion. On March 30, 1861, Governor Charles Robinson delivered the first state of the state address. Among his requests for the legislature was instruction to comply with the state constitutional requirement to develop a state seal. Committees in the house and senate were appointed to develop the design. John H. McDowell of the Kansas State Library Committee suggested a design with a landscape and the motto "We will." On May 20, 1860, a letter in the Leavenworth Conservation stated: "The vexed question of a state seal has at last received its quietus at the hands of the conference committee. The new design embraces a prairie landscape, with buffalo pursued by Indian hunters, a settler's cabin, a river with a steamboat, a cluster of thirty-four stars surrounding the legend "Ad Aspera per Aspera," the whole encircled by the words, "Great Seal of the State of Kansas, 1861." John J. Ingalls, a senator from Atchison, submitted to the committee the design that was finally adopted. However, his design was heavily modified. Ingalls' outlined "a blue shield at the base of a cloud, out of which was emerging one silver star to join the constellation in the firmament, comprising the thirty-four then in the Union, with the motto: 'Ad Astra per Aspera.'" According to D. W. Wilder in his Annals of Kansas, after the committee adopted Ingall's design, "wild heralds of the frontier" altered it by mixing a steamboat and plowing , with buffalo hunting, etc., till really nothing but the motto is Mr. Ingalls', and the landscape is, probably, substantially the one submitted by Mr. McDowell." Ingalls would later serve as a U.S. senator from Kansas and he was later honored in Statuary Hall in the U.S. Capitol in Washington, D.C. 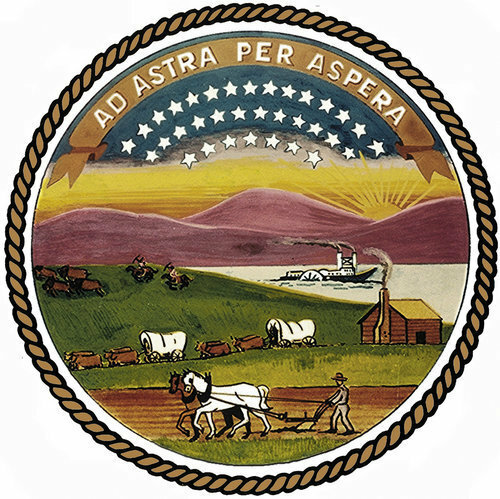 The final Seal of Kansas and the state motto, Ad astra per aspera (to the stars through difficulties), were adopted through a joint resolution during the first Kansas legislative session on May 25, 1861. The resolution outlined the design of the seal. "The east is represented by a rising sun in the right-hand corner of the seal; to the left of it, commerce is represented by a river and a steamboat; in the foreground, agriculture is represented as the basis of the future prosperity of the state by a settler's cabin and a man plowing with a pair of horses; beyond this is a train of ox-wagons going west; in the background is a herd of buffalo, retreating, pursued by two Indians on horseback . . ."
The motto was to be included under 34 stars, representing Kansas' entry as the 34th state in the Union. When used by the governor of Kansas, the circle is surrounded by the words, "Great Seal of the State of Kansas January 29, 1861." The Seal of Kansas, pictured above, without the surrounding circle, is open for use.